My current kindergarten spelling list includes the words one, two, three, four, and five. In lieu of Valentine's Day, I created these clothes pins with candy hearts glued on in amounts of 1-5, and matching word cards. 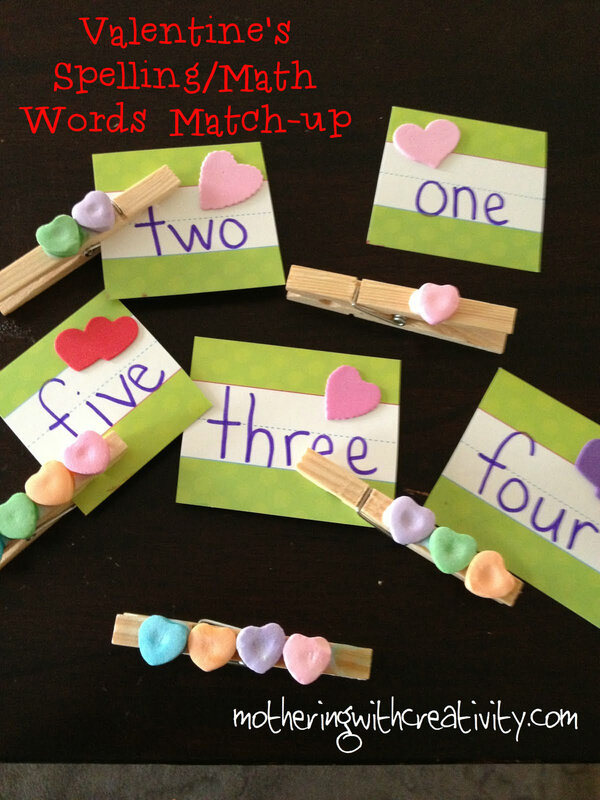 The children can match up the word cards with the matching word card. For some reason, hot glue did not seem to work well with these candies. I ended up using regular Elmer's drip glue and they dried well (took a while, though). I had to redo these many times as Aaron (1 1/2) kept finding them! Haha! He just loves. That's all. He just wants to love. Also. There is a tiny chance you left your brown scarf here and I like it. It may come up missing when next you visit. I've been looking for that! I'm not sure if I buy your story though. You are quite sneaky. Are you sure you didn't hide it?